While Benjamin Netanyahu has not been officially named prime minister of Israel for the fifth time yet, United States President Donald Trump and his Vice President, Mike Pence both personally called Netanyahu on Wednesday to congratulate him on his victory. Top rival Benny Gantz, of the Blue and White party, conceded to Netanyahu on Wednesday, according to Ha’aretz. With final votes still being tallied, Netanyahu’s Likud party was set to receive 35 seats in the 120-member Israeli parliament, also known as the Knesset. While Blue and White were set to receive the same, Ha’aretz reported that right-leaning political parties had pledged support for Netanyahu, with his bloc expected to reach a 65-55 seat majority. Over the phone, Trump “warmly congratulated” Netanyahu and Israel, according to a press release from Netanyahu’s office. 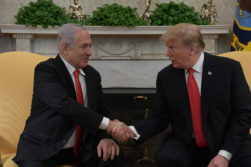 The statement said Netanyahu in turn “thanked US President Trump for his great support of Israel,” listing out the recognition of Jerusalem and the Golan Heights, as well as Trump’s “strong stand against the Iranian regime.” In particular, Netanyahu noted Trump recently designated he Islamic Revolutionary Guard Corps of Iran a foreign terrorist designation. The connection between Trump and Netanyahu reaches even to politics. Trump posted to Twitter a photo of Trump flags being waved at Netanyahu’s election victory rally on Tuesday night. A press release from the office of Israeli President Reuven Rivlin noted that discussions with the political parties on officially naming the next prime minister and forming the next government will begin next week. One of the few significant roles of the Israeli president, which is largely ceremonial, is to officially name the new prime minister of Israel. Rivlin, in the press release, thanked the Central Election Committee and those who counted the votes on a successful election season. “You are the most professional and dedicated expression of how democracy works in Israel,” said Rivlin.